Successfully Added Bright Fairy LED Christmas Lights to your Shopping Cart. Decorate your Christmas tree with these wonderful bright fairy Christmas lights. Designed so elegantly to provide a beautiful luminous lighting environment that will make this years Christmas extra special. 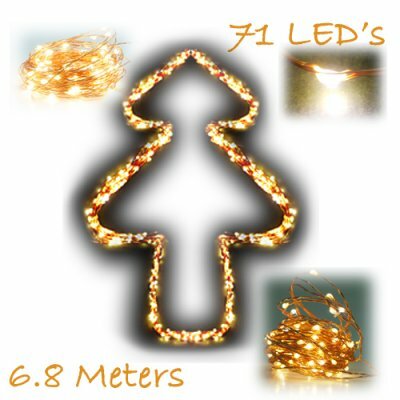 Witness amazing brightness with 71 LED's and make great use of the extremely thin and durable copper wire that lets you shape this Christmas fairy lights in to any shape or sign that you desire, unlike boring non water proof traditional Christmas lights. These waterproof fairly Christmas LED lights are covered and protected in transparent silicon gel which allows for a 360 degree lighting coverage. Having an extremely well light Christmas tree, will make your Christmas evening all the better, and will definitely make your neighbors and guest envious of your Christmas decorations. It’s not just about lights, it about the quality of the lighting that is displayed on your Christmas tree. Let this Christmas shine and lead the way on to the the new year with these exceptional fairy LED Christmas lights that are available at an unbeatable factory direct wholesale price from Chinavasion. Waterproof: Yes, can be submerged up to 1 meter in water. What is the life span of the LED's? The life span of this LED fairy Christmas lights can last up to 30,000 hour.